LITTORAL REGION, Cameroon, Jul 4 2013 (IPS) - In Maleke village, western Cameroon, an oil palm tree is considered to be “black gold”. 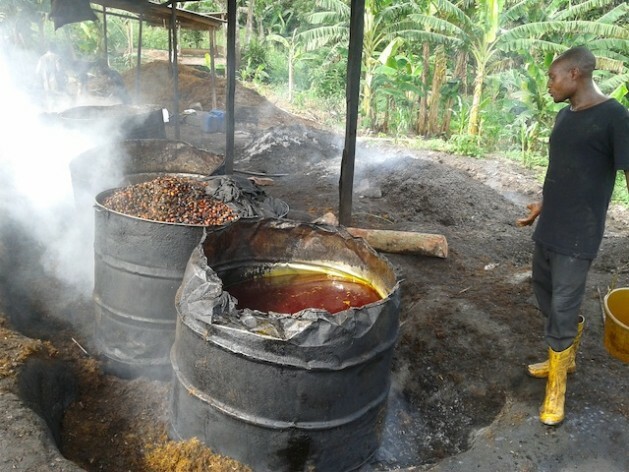 At least, that is what Joseph Tesse, the local processor of oil palm, tells IPS. “Every household here has a parcel of land with oil palm trees,” Tesse says of the residents in his village in Cameroon’s Littoral Region. The tree, which is indigenous to West Africa, bears a fruit that can be processed to make palm oil, an essential ingredient used for cooking here. Palms are also used to produce wine and liquor. But while Cameroon may be the third-largest producer of palm oil, after Nigeria and Côte d’Ivoire, it has an annual deficit of the oil for domestic consumption. More than 80 percent of the palm oil produced here by agro-industries is exported to Nigeria, the Middle East, France and other European countries, Pierre Jonathan Ngom, national coordinator of Small Holder Oil Palm Development Programme Cameroon (SOPDP) tells IPS. According to statistics from the Ministry of Agriculture and Rural Development (MINADER), Cameroon produces about 200,000 tonnes of crude palm oil annually. Agro-industrial palm production accounts for 140,000 tonnes, while small-scale farmers produce the remainder. “Supply for local consumption keeps falling as much of the oil produced is consumed by the processing industries and export markets. Following this trend, locally-produced palm oil has become a niche item on local markets,” Ngom says. “The cultivation of oil palm trees is less expensive as compared to other cash crops. The use of pesticides is fairly limited and oil palm trees gives the highest yield of oil per unit area compared to other crops like soy,” Ngom says. Smallholder farmers are rising to the challenge of meeting the country’s shortfall of local supply of this commodity. “Oil palm trees are most resistant to drought and climate change and require little or no fertiliser or chemicals and need less care as compared to cocoa and coffee,” Deborah Mokwe a farmer from Maleke village tells IPS. She is among 200 individual oil palm tree farmers in the village. Gladys Njeni is another. “A litre of palm oil now sells for 1.90 dollars on local markets as compared to 90 cents in early 2000,” Njeni says of the lucrative local market for the product. Njeni is a customer at Tesse’s artisanal mill and she has brought her harvested fruit to be processed. “When I bring one tonne of ripe bunches of fruit (for processing) it produces 200 litres of palm oil, which I can sell to retailers for 180 dollars a tonne,” Njeni says. But the extraction process at Tesse’s informal oil press mill is a slow and laborious one – even though he employs nine people to assist him. “The work is very cumbersome, so men do the more difficult phase of the work while women do the selection of fruits and decide the form in which the produce is to be traded,” he says. Tesse’s extraction process involves the fermenting and boiling of the fruit in large steel drums. Once the oil is extracted, it is diluted and passed through a sieve and then boiled once more. “Artisanal production is not a sustainable way of processing palm oil. It entails a lot of waste in the quantity and quality of the oil – about 25 to 40 percent. A by-product is palm press fibre which cannot be extracted,” Alain Nkonji, an agricultural engineer with Societé Camerounais du Palm, a company involved in the production of palm oils, tells IPS. But farmers here use this waste to fertilise their crops. “In the 1990s, I used chemical fertiliser on my farm because it was cheap. Just before 2000, a 60-kg-bag of fertiliser was 18 dollars, but today it is 48 dollars, so I use the palm press fibre as manure,” Njeni says. According MINADER, small-scale producers in Cameroon generate yields of less than one tonne of palm oil per hectare. But in Indonesia and Malaysia, small-scale plantations achieve yields four times those of their Cameroonian counterparts. One of SOPDP’s aims is to increase this output, through the distribution of improved species and loans. The programme aims to increase national palm oil production to 450,000 tonnes by 2020. “We also plan to create three pilot processing plants in major palm-oil-producing localities where farmers can process their produce at a reduced cost and minimise waste,” Ngom says.